When you update to the next version of ITunes and see that the genre list has been expanded to include "Rootstronic," you're going to thank us for having kept you ahead of the curve. That's what the cool kids are calling this startlingly unique blend of Kingston mashup and dubstep electronica you'll hear in the video below from the Courtney John Project. The sound may be new, but the creators are far from rookies. Courtney John, on the right in the photo, is becoming well known in his home country and the US for his Lovers Rock reggae, including 2009's critically acclaimed Made in Jamaica, released by Jamaican label FiWi Music. Steven "Lenky" Marsden (left) is is a Grammy-winning dancehall producer and multi-instrumentalist, while producer Nastasia "The Wizard" Hammond (center) recently teamed up with Nelly Furtado to do a dancehall remix of a song from the latter's brand new record. So check out this excellent song, "Soul of a Man," which will be on their debut album, The Future, to be released by FiWi at the end of January, '13. I'm very fond of this kind of record. What kind of record is that, you might ask. It is a record that on the most immediate level dwells in the musical world of the past -- the Postcard, Sarah and Creation labels, the C86 sound, and production that is tasteful and competent by devoid of gloss. But at a deeper level, it is a record made by musicians that are making the record that they want to make because that is the sound they want and their mates are the guys they want to play with. Current musical tastes and charts just don't enter the picture. So The Memories That Hold Us Together by Falling Trees is an album that takes you back to a wonderful era of guitar driven pop music. And given that introduction, it is perfectly appropriate that the album is released on Exeter, UK's Pastime Records. The members of the band are Andrew Padfield (lead vocals), Paul Stolworthy (rhythm guitar), Andy Botterill (lead guitar, bass, keyboards) and Chris Head (drums) and Andy Ward (additional drums). The production duties were handled by Andy Fonda, drummer from C86 favorites, June Brides. Track 3, "November Rain", boasts a bubbling bass line and has a relaxing vibe. There is plenty of genuine emotions in The Memories That Hold Us Together, but it never beats you over the head, and it is all adroitly dress in hooks and professional craftsmanship. The result is an album to savor and explore. Bootsy Collins of Cincinnati Ohio was born on this day in 1951. Funky doesn't begin to describe this unique character and monster musician. Bootsy's bass playing is the blueprint of funk music. Digging around on YouTube for Bootsy clips is a lot of fun and I recommend it. Here's three I like a lot. We here are big big fans of Peter Buck. And garage rock. And noisy guitars. That's the great Lenny Kaye too. From Peter's solo album, available on vinyl only, very limited edition. (yet another excuse to visit Portland where the record was released). This isn't, um, fancy pants R.E.M. stuff. For the live shows. he's calling this band Richard M. Nixon, which I find both hilarious and perfect for reasons I don't know how to articulate. Funny is funny. And rock is rock. And this is great fun. The band is Max Bianco, Dali, Al Devon, Richie Docherty, Chris Hooks and Keith Wilkinson. Their second full length album is scheduled for release in 2013. Meanwhile, "Broken Minded" is available from iTunes. A few years ago the members of Boise, Idaho band The Very Most and Glasgow's The Hermit Crabs collaborated on a song for a collection. Simply because the centerpoint of a line between Boise and Glasgow resides on Baffin Island, the group also was named Baffin Island. Although their original bands are on-going (we covered a fine EP by the Hermit Crabs last month) they combined again in 2011 to release an EP on EardrumsPop, and have just released a four-track self titled EP on WeePOP!. It is fine, sweet music that will remind you of Camera Obscura and Belle and Sebastian. Suggested use: Background for getting close with someone else. Stream "We Were Meant to Meet" here. Baffin Island is Meanie Whittle (vocals, recorder, songwriting), Jeremy Jensen (guitar, bass, keys, vocals, songwriting), Jake Hite (drums), Chris Gilles (bass), and Jo Bunyan (keys). When I first became aware of The Maginot Band, they weren't The Maginot Band. They were The Maydays (prior posts here and here). I don't know whether the Caithness natives (far northeastern Scotland) are hiding from the law, or just dodging some ex-girlfriends, but the name has changed. However, the lineup is remains the same, and they still make great music. Their latest effort is the Peace and Quiet EP, which is out now on the When You Awake label. With six members (Jordan Shearer - vocals, Calvin Wilson - bass/vocals, Kevin Swanson - guitar/vocals, Jamie Swanson - guitar, Liam Whittles - organ/piano, and Darren Coghill - drums), the band features a full sound with bright guitars and athemic keys and vocals. The organ is prominent, and the overall sound is indie pop with a touch of psychedelia. It is great listening, folks. All the tracks are included for your evaluation below. I have included the Soundcloud version of the lead single, "Slow Down Sundial", as well as the video because it contains a link for a free download. You may stream and purchase the Peace and Quiet EP at the Bandcamp link below. Begun by Melbourne's Josh and Joel Meadows when they were teenagers, Sugargliders were a DIY, mostly self-taught effort that produced honest, original, unpretentious pop songs about the things that mattered to them. Nowhere in their catalog of ten vinyl singles and one album does the listener sense that a song was imitating some other group, or following a trend to capture chart placement. They had a four-year run from 1990-1994, with releases on Summershine Records in their home country and Sarah Records in the UK and a stint living in the UK. The Meadows brothers were joined from time to time by Marc Fulker (drums) and Robert Cooper (The Earthmen). And then they were done. 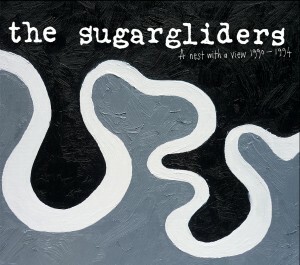 Fortunately for we guitar pop fans, Popboomerand Records in Australia and Matinee Recordings in the US have joined to issue a 20-track compilation of Sugargliders, A Nest With A View 1990 -1994. Here is the trailer for the album, which provides snatches of the great music and photos of gig posters, band members, jacket covers and other memorabilia. Warm guitars and clean, simple and affecting melodies. This is a compilation that can fill your fall days with the music you need. If you agree, the links are below. But first you can listen to a few songs. Go ahead, you deserve it. And here's a video for "KLART BLIKK", made by 5th graders from Ve and Hånes elementary schools during an animation work shop at Kristiansand International Children's Film Festival 2011. We hope to have more to share with you soon. 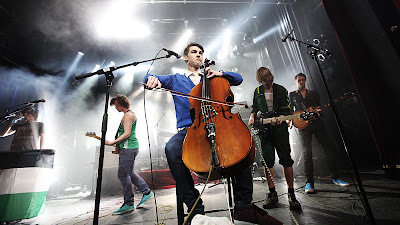 They've nailed the old-school punk sound and between the buzzsaw guitars and shouted vocal harmonies - and the exclamation point provided by the unexpected cello front and center - it's both bracing and enjoyable.